A white tin or lead glaze on a pottery or earthenware body was first conceived in the Middle East. It is generically referred to as Isnik pottery after the town of Iznik in Anatolia where it was made in volume from the late 15th century, although it's true birth was several centuries earlier. Certainly, there are monochrome lead glazed tiles in existence in Afghanistan as early as the late 12th century. 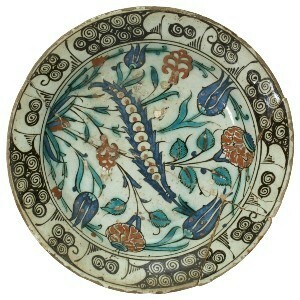 An Isnik pottery dish, 17th century. One can assume that this was the potter's response to the early Chinese porcelains and there are plenty of Ming inspired designs, particularly with grapes, pomegranate, lotus and peony–like blooms in blue, contained within borders of wave and cloud scrolls. The early shapes also reflected Chinese roots with large chargers, altar candlesticks and 'garlic shaped' vases. However, by the 1540s, there was a virtual flowering of colours with the addition of aubergine and green and, by the 1560s, a striking tomato red, but still with a heavy emphasis on flora, particularly the saw-like saz leaf, tulips and carnations. 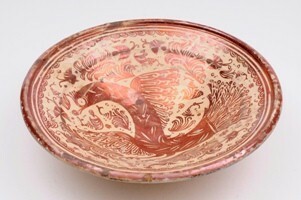 A Hispano Moresque (possibly Valencia) dish. The Arabs in Spain chose a different route, I guess in response to the raw material available to them. They chose a metallic copper-toned lustre generically now labelled as Hispano-Moresque. Their designs seemed a little more naively executed, but were generally more profuse with all of the upper surface (and often much of the underside) being decorated. Again, floral and foliate designs abound, but with more emphasis on complex 'patterns'. Hispano-Moresque pottery has been produced continuously since the mid 15th century – long after the ejection of the Arabs from Spain. 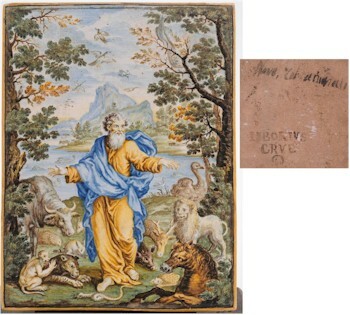 A Castelli maiolica plaque by Liborio Grue, mid 18th century. Italian maiolica was initially influenced by Arab imports from Spain during the mid 15th century. It developed a character all of its own, with profuse use of yellow/orange coupled with blue and green and a preference for busy, so called, 'istoriato' Greek or Roman mythological stories (geographically hardly surprising) or Judeo-Christian subject matter (again no surprise), with a Renaissance outlook. Maiolica production occurred in countless centres across Italy though Florence, Siena, Venice, Gubbio, Faenza, Castelli and particularly Deruta and Urbino. A Strasbourg faience basket, circa 1770. Faience, sometimes Fayence was, perhaps, a response to the overly fancy and busy decoration maiolica starting in Faenza but migrating to France by the early 17th century and from there outwards towards the German states and across to Spain. Covering three broad country states, the range of style, shapes and decoration is too numerous to be reduced into a couple of paragraphs. 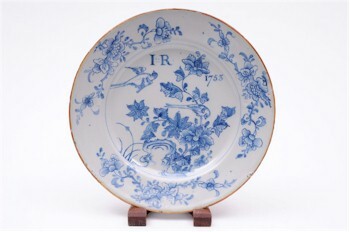 A dated English Delft plate, circa 1753. Although Whit Chiny, Whitt China or Galley-ware is recorded as being imported to these shores from the Mediterranean, home-grown tin-glazed earthenware was produced in Britain during the last decades of the 17th century. This was generically known as Delf or Delft Ware by the early 18th century, although some of this delft may have come from the Low Countries courtesy of King William (of Orange) and his personal collecting habits. 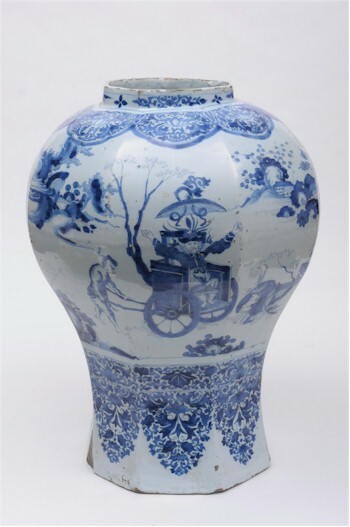 A Dutch Delft vase in the Chinese manner, early 18th century. With the exception of such grandiose collectors and their penchant for flower pyramids and vases, much delft production was utilitarian in nature being plates, bowls, dishes, smaller vases, apothecary's jars and tiles. The principle centres of production were primarily London and Bristol, with Liverpool and to a lesser degree Glasgow and Dublin – all ports, so little surprise that a significant volume found its way to America. 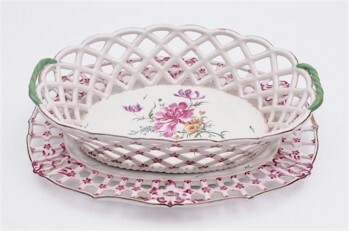 Produced as an imitation of Chinese porcelain, it struggled once porcelain was produced domestically in Europe and found little favour, if any, by the early 19th century.